Mumbai: Monday 6th/Tuesday 7th/Wednesday 8th: Partly sunny to cloudy skies. A couple of passing showers in some areas will bring much needed relief. But, rain amount may not exceed 5-7 mms per day. stuffy nights continue. Interior regions of Maharashtra (Madhya Mah, Marathwada and West Vid) will remain practically dry without meaningful rainfall till next 4 days. The Monsoon axis is stubbornly fixed in the North, and the fresh WD ( JL-1) is preparing to proceed, come what may ! The OLR index (SAMOI-N) indicates the meridional shift of the active convection area associated with the Asian summer monsoon. 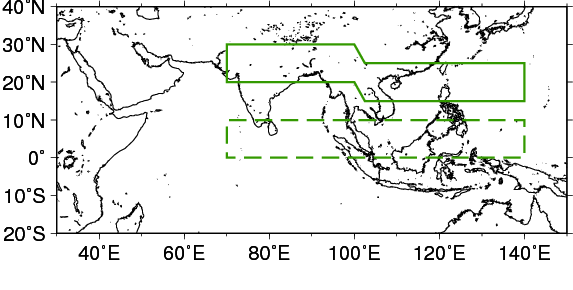 SAMOI-N is defined as the difference between the reversed-sign area-averaged OLR anomalies over the area from northern India to northeast of the Philippines (shown by the area enclosed by the solid green line on the bottom) normalized by the standard deviation and those over the area from the central North Indian Ocean to southeast of the Philippines (shown by the area enclosed by the dashed green line on the bottom). Positive and negative SAMOI-N values indicate northward and southward shift of the active convection area, respectively, compared to the normal (i.e, the 1981 - 2010 average). The thick and thin green lines indicate seven-day running mean and daily mean values, respectively. 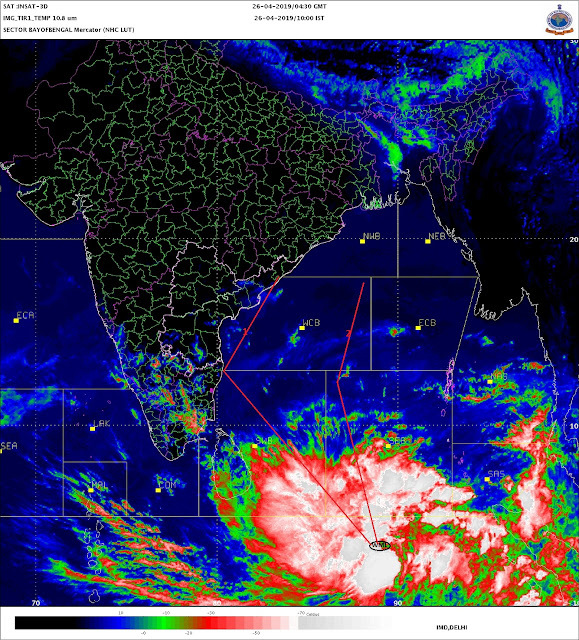 Monday 6th: As mentioned on 1st July, the Inter Action of WD ( JL-1) with the Monsoon axis starts from Monday 6th July. Northern Indian States of Punjab, Haryana, H.P. and Utterakhand get good precipitation on Monday 6th July. As the day proceeds, rains become heavier by afternoon /evening in Indian Punjab, adjoining Haryana, West U.P. and Uttarakhand. Spill over into North Rajasthan possible. U.P. regions East of Delhi (Barielly) will be receiving heavy falls. Adjoining East M.P. can get showers also as the entire axis line is prone to rainfall. Delhi NCR starts getting showers from Monday evening. Tuesday 7th: Monsoon entering Northern Pakistan. More concentration of heavy rains on Tuesday (more likely as the day progresses) in Pak Punjab. All regions in North Pakistan get heavy showers. Gujrat (Pakistan) gets showers on Tuesday, amounting to around 15-20 mms on Tuesday. Heavy falls in Nepal. Heavy rains also possible in Sikkim, leading to overflowing of local rivers downstream. Rainfall in Indian NW regions may be a little less compared to Monday. Delhi NCR will be cloudy with showers interspersed in the day. Around 30 mms Tuesday day and Night. Wednesday 8th: The entire stretch from Pak Punjab thru Indian Punjab, Haryana, U.P, Uttarakhand and North Bengal get moderate rains. Delhi NCR may get less rains also, but the intensity will be more on Thursday again. From an already formed UAC,a Low ( BB-2) forms in the North Bay of Bengal on the 7th. May concentrate in WML and maybe depression (992 mb), before crossing Odisha coast around 10th. But strength and Track depends on WD trough behaviour. If JL-1 can bring down the Monsoon axis to the South near Rajasthan, then this BB-2 can possibly track West wards. If the persisting WD trough extends Eastwards, the BB-2 may head North. Vagaries is unsure of the track today. 2.) in the Northern end may bring some light rain relief to Saurashtra for a day on Tuesday/Wednesday. Strong SW winds will continue in Saurashtra and Coastal South Gujarat next 3 days. But most of Sindh (including Karachi) will remain practically dry and hot.temperatures may shoot to 46/47c next 2/3 days. Kolkata: Oh Calcutta ! And it goes on..Thunder showers again on Monday and Tuesday...around 15-20 mms average. So it seems first half of July atleast wil be shortfall erasing earlier surplus. .. sir any impact of typhoons in Pacific Oceans? Are those connected with swm performance? Nilay: As you see in the right side (top) of Vagaries blog, the deficit is already wiped out...The Monsoon performance is updated regularly in this space. Also, I have explained in brief ( see diagram) the "Monsoon Activity" (axis) has shifted Northwards of normal position from Pakistan thru India, Northern Thailand and North Laos. There are 3 typhoons in action now..."Linfa", "Chan Hom" and "Nangka" in line in the Pacific today. But they are all North of Laos. On Monsoon axis shifting South (if and when), then these typhoons could strike near Vietnam region , and that can help send pulse to Bay of Bengal. Otherwise, we have to wai for a 'in situ" puls, that is formed in Bay itself. emkay: SAMOI-N is followed by vagaries as a "back up" when things like Monsoon axis gets into a "desperate" situation. Helps in getting long range time forecast for axis movement. Thanks sir for quick reply on typhoons effecting swm performance. Thanks for inviting attention on daily update of swm performance. As I am habituated to use the android application missing out tht space. entire south india very quiet. Heat wave in AP and north TN!! This is very rare event as I don't remember such daily weather report from RMC Mumbai in July ever earlier !! As at least some Konkan towns or ghats area will report between 1 to 5cm in break SWM period..